Skill and compassion go hand in hand when providing exceptional patient care. 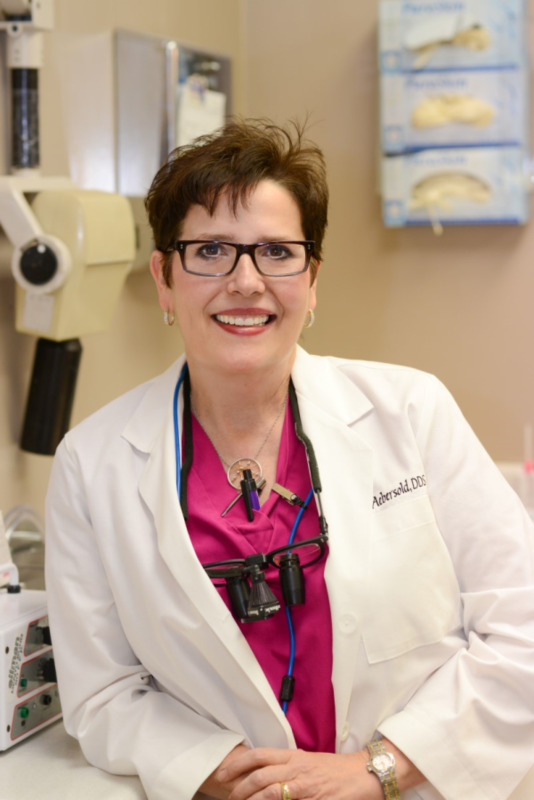 As a dental professional, Dr. Anita Aebersold stays up to date on the latest advancements in dentistry in order to provide the most current treatment options for her patients. As a doctor, she recognizes that her patients are unique individuals who have placed a great deal of trust in her and her team. That is just one reason why she values each and every patient relationship. She appreciates the time you’ve taken to visit this site and find out more about this dental practice, her team, and the many services we can provide to help you achieve optimum oral health. Dr. Aebersold was born and raised in Saltville, Virginia, a small town in the foothills of the Appalachian Mountains. She graduated from Cleveland High School in 1973 and attended East Tennessee State University in Johnson City, Tennessee, graduating in 1976 with a degree in Dental Hygiene. She attended dental school at the University of Tennessee Center for Health Sciences in Memphis, Tennessee and graduated with honors in 1982 with a degree of Doctor of Dental Surgery. She was inducted into Omicron Kappa Upsilon National Dental Honor Society and the Richard Doggett Dean and Marguerite Taylor Dean Honor Society. After graduation she opened a general dental practice in Little Rock, Arkansas in 1982. She practiced in downtown Little Rock for two years then moved in 1984 to her present location on University Avenue. She enjoys staying abreast of current dental technologies, with a particular interest in cosmetic and implantology dentistry and full mouth rehabilitation. Dr. Aebersold attends Christ Episcopal Church in Little Rock, and her leisure activities include gardening, travel, metal art, welding, and scuba diving. Her philosophy of life is to treat people as you would like to be treated with honesty and integrity, and to incorporate that philosophy with employees and patients. She is a member of the American Dental Association, the Arkansas State Dental Association, and the Central District Dental Society, and a member of the International Congress of Oral Implantologists. Dr. Aebersold is recognized as one of America's Top Dentists.